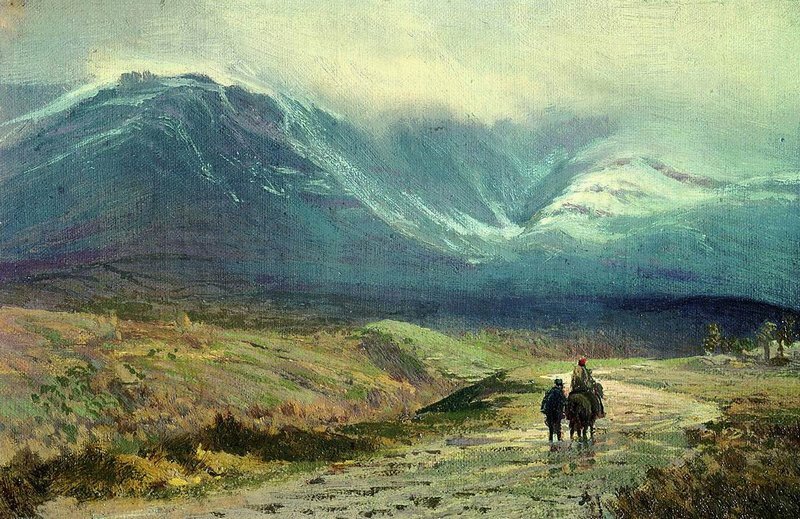 Fyodor Vasilyev’s “In the Crimea after a Rain”. Public domain image courtesy of Wikimedia Commons. I’m not saying it’s been raining a lot here in the D.C. metro area, but I swear I saw the Ark pass me in traffic the other day. Seriously, I’m wondering why the Potomac isn’t flooding by now. We have had rain almost every day for the last few weeks. Once in a while, Fate decides to be merciful and let us dry out….at least until the next deluge. And if that weren’t enough, the Shenandoah River decided to pay us a visit. Imagine a large rectangular neighborhood, with the river running around one long side and one short side. One side of the neighborhood is higher than the other (fortunately, that’s where our house was situated). Over the course of a day, the river crawled up the riverbank, went across a huge meadow, covered the road and started coming into our front yard. We had a gravel driveway. For amusement, we drew lines in the driveway, watched the water come over that, walked backward, drew another line in the driveway, watched the river erase that line, and so on. I’d say it got at least 20 feet into our front yard. Luckily, the house didn’t do too bad. Our riverside neighbors were not so lucky. One family had a basement wall taken out by the flood water. (And they were “not in the flood plain”. Ha. Flood water goes wherever it wants. Despite the constant showers, I still like rain. Nothing seems to be as soothing as sitting in a rocking chair on a country house’s porch, watching the rain come down or reading a book. Or opening a window that is protected from the rain and listening to it falling. But I could do with a break from rain, for now. When it ceases (if ever? ), I’ll have to play my special sunshine song. (Video courtesy of JeffLynneTribute, YouTube.